Nae Scots? 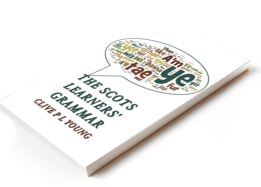 Hauf – NE Scots? Funny onnieweys. http://www.scotslanguage.com/ The desperate plight of a Moray man who, unable to locate a sufficient quantity of minced beef for his evening meal, finally loses the plot and takes vengeance with his frenzied rap. Lyrics: Six in the morn, oot ma baed Cup o’ haet caffee, git the paper raed Rake in the tinnie fur a wee jam scone Nihing bit crumbs, fit the hell’s gin oan?